Spice up your deluxe tree house with a tower! If you like it, be sure to come back for more. Thanks to our customer Jay N. for creating this plan and submitting to us! A great addition to any tree house, this look out tower makes your tree house into the ultimate fort for your kids. 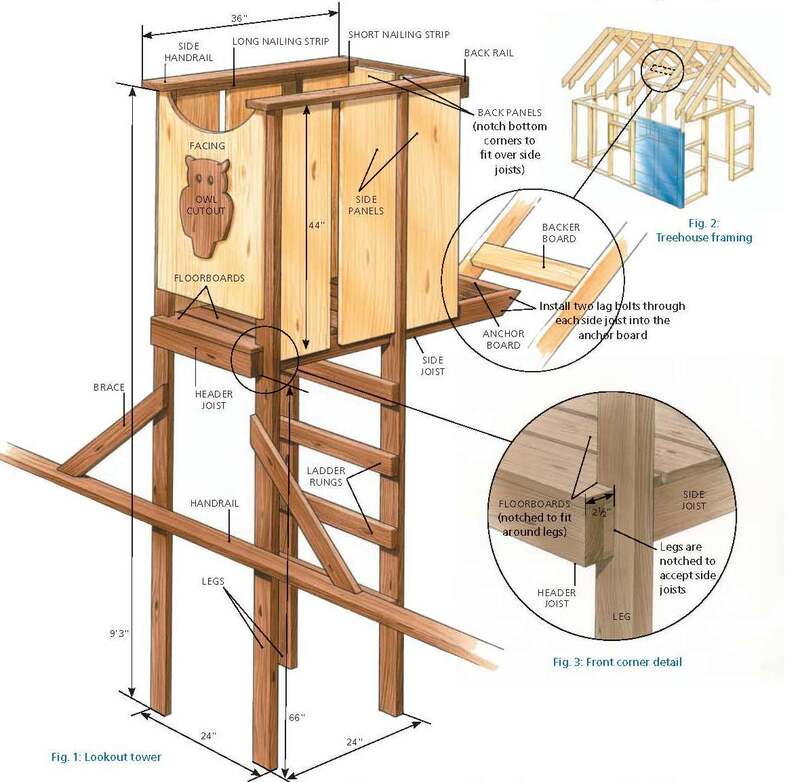 This particular wood plan shows you how to building a tree house look out tower for your backyard. 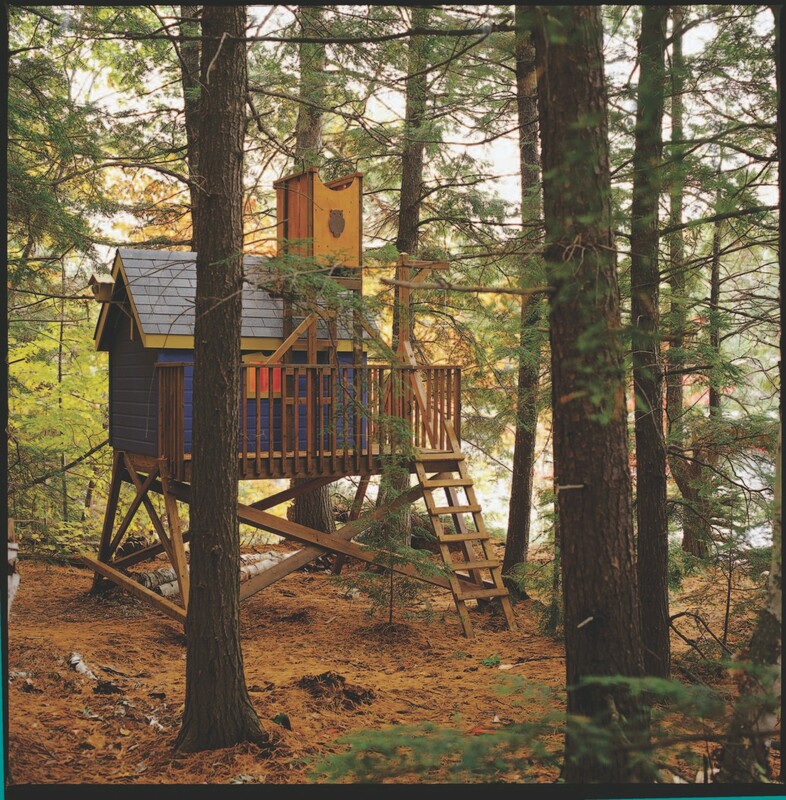 If you've already built our tree house plans, then you have to add this look out tower! Please enjoy this nice set of free wood plans! Please make sure you check out our custom shed plans in our shed plans package before you leave our site and see if they meet your needs as well. Our shed plans package has thousands of wood plans just like this, not just shed plans! We also have a great set of Jungle Gym plans for your backyard. If you don't want to build a tree house, how about a kids Jungle Gym? They are all available for immediate download! Do your kids want to live it up? Here’s how to get your tree house decked up with a new tree house tower. 1] Start by cutting the four tower legs. You’ll need to lay out a 11⁄2" x 3 1⁄2" notch on each of the legs, 66" from the bottom, to accept the 2 x 4 side joists that support the floor and anchor the tower to the roof. I laid all four on edge and clamped them together tightly to make cutting the notches easier and more accurate. Set the depth of your circular saw to 11⁄ ⁄2"; carefully make the two cuts that define the notches and then make multiple passes between them. Unclamp the 2 x 4s and carefully chisel out the waste. Tip: Chisel out the waste working up from each side of the 2 x 4 and then chisel out the hump in the middle – this will minimize chipping. Work diagonally across the cut. building and out to the deck edge. These lines should be 24" apart. Secure two of the legs to the deck floor and the handrail so that they are plumb. I used 31⁄2", #10 deck screws, screwing up through the deck boards into the base of the tower legs and through the legs into the handrail. 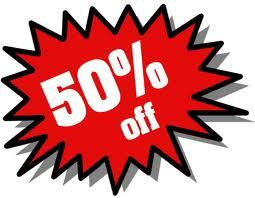 Remember that the notches face in. 3] Make the anchor board by ripping two edges off a piece of 2 x 8 at 45° (as in Figure 1) and cutting it to 17" long. For the side joists, make a 45° cut across the middle of an 8' 2 x 4, then cut each piece to an overall length of 48". The anchor board sits on the shingled roof, between these two joists. Set each joist in the two tower legs and rest the mitered ends on the shingles. Screw through both joists into the anchor board; a single screw will do for now. Position each joist so that it’s level and square to the two tower legs. Fasten the anchor board to the roof with two 2" screws, and the joists to the tower legs. Stand the other two tower legs in place so the joists sit in the notches and the legs are plumb and 24" (outside edge to outside edge) from the first two. Screw the joists to the second set of tower legs and the legs to the tree house deck. 4] Drill two 5⁄16" holes through the anchor board and the roof. Cut a piece of 2 x 4 (not pressure-treated) to fit between the rafters, inside the building and opposite the anchor board. Using the two holes you drilled to help position this backer board, screw it to the rafters. Finish drilling the 5⁄16" holes through the backer board. Bolt with two 5⁄16" x 5" carriage bolts. To prevent leaks, use a good quality clear caulking to seal the anchor board and joist ends where they meet the shingles. Drill two 5⁄16" holes through the end of each joist and about 1⁄2" into the anchor board (drill at a bit of an angle). Hammer four 5⁄16" x 5" lag bolts, with washers, into the holes and tighten. 5] If you like, soften the front corners of the two side rails by trimming them off with a 45° cut. Screw them to the tops of the tower legs (the front edges sit 21⁄2" proud of the front legs). Cut a scallop in the top of the 1⁄2" plywood facing of the tower (I used a garbage can lid to mark the curve). 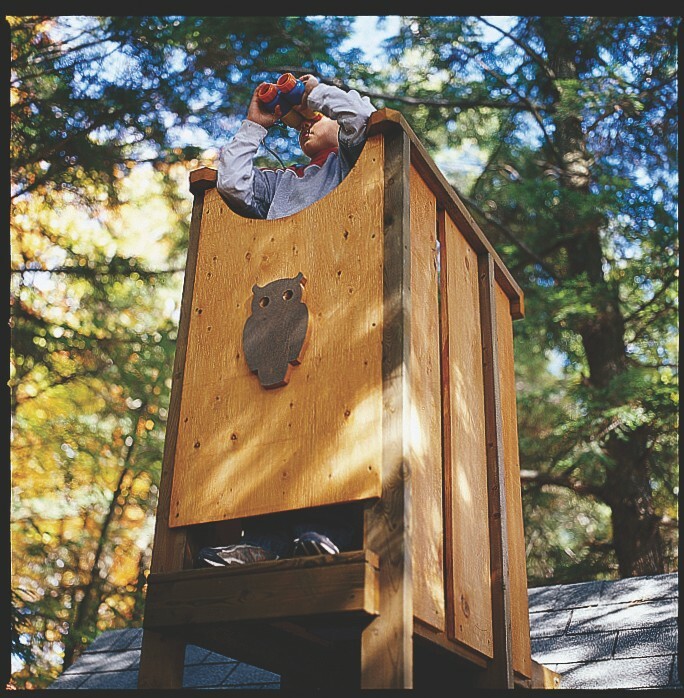 Make the owl cutout – same size as for the tree house door – from a scrap board and mount it on the tower facing. Drill two 1" eyeholes through both owl and facing. Attach the facing to the front of the tower legs with 2" screws. 6] Cut the two diagonal braces and attach to the deck handrails and the tower legs. Screw the tower header joist to the ends of the side joists. Rip a 5⁄4" deck board in half and cut six 24" rungs; screw the top one (with 21⁄2" deck screws) to the back legs 91⁄2" below the top of the joists and the rest spaced 101⁄2" apart. Cut two precut pressure-treated balusters to make the nailing strips. Screw these nailing strips to the underside of the side handrails, flush to the inside edges – the longer pieces between the two legs, and the shorter one from the back leg to about 1⁄2" short of the end of the handrail. (The back panels need to fit in this gap, so check the short nailing strip before securing and trim if needed.) Screw the back handrail (turned on edge) to the ends of the side handrails. 7] Now, for the floorboards and trap door boards. Once they’re cut to length, you’ll need to notch two of the floorboards to accommodate the legs (see Figure 4). Screw or nail the floorboards to the joists (drill clearance holes in the floorboards to prevent splitting). 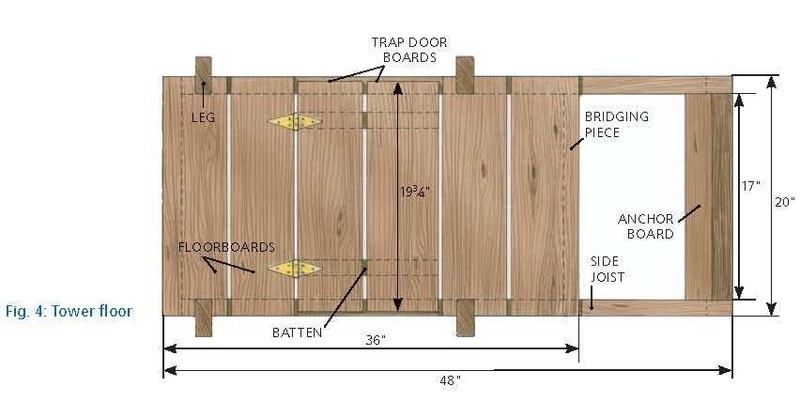 Screw the two battens to the underside of the two trap door boards and hinge (with 4" strap hinges) to the fixed floorboard second from the front (see Figure 4). Install a bridging piece between the joists and flush with the edge of the floorboard at the back. Add two handles to the inside of the rear tower legs, about 2' up from the tower floor, to make climbing easier. 8] Now to close in the sides with roof boards left over from the tree house construction. You will have to notch the two back panels to fit over the side joists. Screw or nail these to the bridging piece and to the inside of the back handrails. Attach the side pieces to the side joists and the nailing strips under the handrail. 9] Finally, I attached a piece of Ensolite – you know, the cheap blue camping pads available at any outdoor store – to the underside of the access door. This will soften, a little at least, contact with a kid’s head if the door is dropped accidentally (or not so accidentally, depending on sibling relationships). If you like this free set of wood plans, you should check out the plans we charge for! Please make sure you check out our shed plans in our shed plans package before you leave our site and see if they meet your needs! Our shed plans package has thousands of plans like this included in an easy to print PDF format.